I realized today that I don't have enough raspberry nail polishes. I want to take advantage of some points I have with Zoya where I can get 3 polishes for $10. After wearing this today, I decided I need another cranberry/raspberry polish and I am going to get Zoya Reagan. This is Essence Surferama and I got this a few years ago from Ulta with a few other shades from the Surfer Babe Collection (below). I love this collection and the quality of these polishes are amazing. They are so opaque...I could get away with one coat! Raspberry colored nail polish is so pretty and girly. I am loving this! Do you have any favorite raspberry shades? 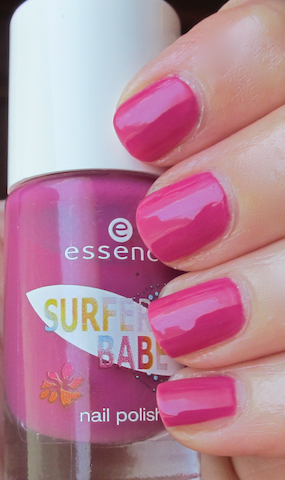 This is the Essence Surfer Babe Collection. I love these 3 shades and regret picking up the teal one. You can't tell as much on this photo, but Hang Loose is a really light lilac shade. I don't have any other Essence polishes, but these make me want to grab some more! This polish is indeed a long shot! Love this kind of colours myself! You found these at your Ulta?? That's awesome! I just finished off my collection with Surferama and I love it. I think all the colors in this collection are great. Plus, Essence formula is just perfection. Yes, but it was probably over a year ago. Do you know if they are still available? I just haven't gotten one of those little bottles because I won't be able to paint my nails in the same manner. I always sit on the couch and hold the bottle between my knees - I don't know if I could do it the same with those tiny bottles??? Yep, makes me hungry for raspberries! This is a little too pink for me-but it looks great on you! I hope so cuz it's on its way! I definitely need more Raspberry, I wish we had more Essence availability here, the ones I have apply like a dream, almost all are either one coaters or very close to it!